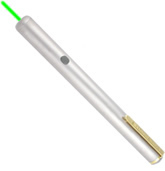 This is the ultimate green laser pointer for meetings, briefings, lectures, astronomical viewing, inspections, or simple highlighting. Unlike red lasers, this extremely bright green laser is emitted at 532nm, a wavelength that is very easy for the human eye to detect. Projects a green dot on virtually any surface making it ideal for multimedia presentations and everyday use. Makes a great personal or corporate gift.